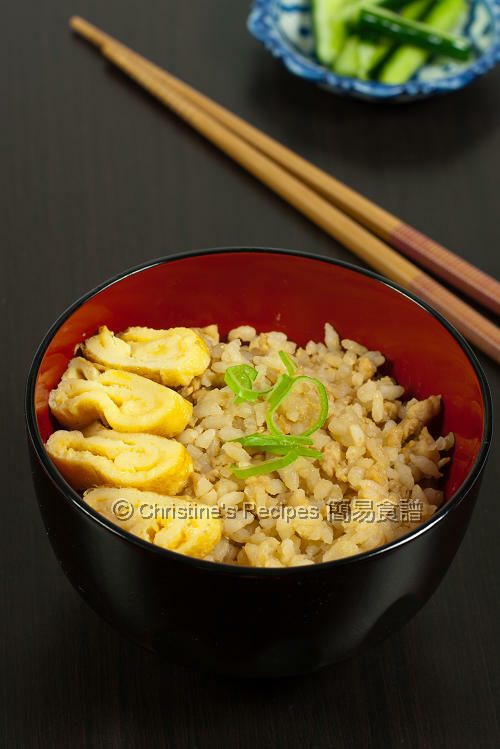 This Japanese ground chicken rice is scrumptious, simple and quick to make, full of Asian flavours, best for hectic days or winter days, lunch or dinner. Being a typical Chinese family living down under here, we always have rice for dinner. Ellie from AlmostBourdain via twitter once asked if I still keep the tradition of having Chinese dinner with three courses together with a soup. Yes, as long as I have enough cooking time. Life is so hectic that I can’t keep the tradition as I wish sometimes. But rice will definitely be served on our dinner table as it’s my husband’s most favourite. Or I can say he is a typical Chinese man who can’t live without rice on a single day, whereas my daughter loves tasting different foods in a wide range of variety. So, the same question repeatedly comes up, whether to have Chinese or western cuisine or other kind of dishes for tonight’s dinner. Being a homecook, I have to find a way to please every different palate in the family, without putting too much pressure on myself. That’s why I continue on the search for simple, easy ways of cooking delicious dishes for my family. Rinse rice and drain well. Put the rice and water in a rice cooker. Cook until the rice is done. Mix ground chicken with marinade. Cook in a frying pan over medium-low heat until cooked through. Stir constantly and separate the lumps if any while cooking. Set aside. Whisk egg with water. Season with salt, pepper. Pour the egg onto the pan and cook into a thin cake. Dish up and shred the egg. Set aside. When the rice is cooked and ready, add the chicken, stir in the seasonings. Divide and transfer to serving bowls. Garnish with the shredded egg, scallion. Serve hot immediately. The advantage of cooking the chicken before mixing with the rice, you’re pretty sure that the meat is cooked well and get the chicken absorb all the flavours in the seasonings. Or you can skip the step of stir frying the chicken, just quickly toss in the marinated chicken onto the surface of rice when it’s nearly cooked, but not cooked through yet. Immediately close the rice cooker cover, let the rice cooker continue to cook through the chicken. Wait until the chicken is done, then stir in seasonings and mix well with the rice. Oh... I cook a version of this as well. I used minced pork instead. Love the rice, Christine. Also am loving the way you serve the egg rolls with it.. This looks delicious--my family would definitely love it! Thanks for the shoutout! Adore all your ideas here, your presentation is simple yet very attractive. 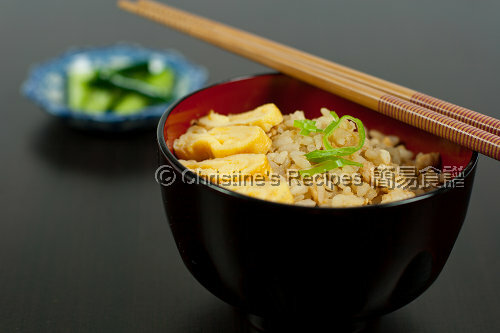 I am not a rice person and yet this rice looks very appealing to me...lovely photos! I'm a lazy mama doesn't cook rice and soup every day. 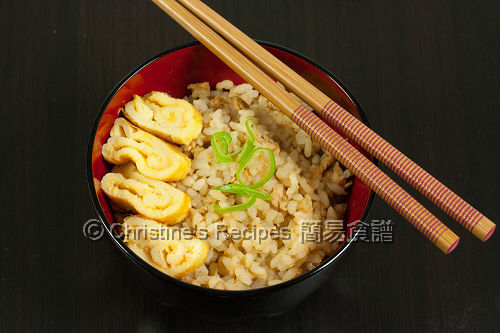 Your chicken rice looks good and easy to whip up! Love your beautiful shot! This looks really homey and delicious! sounds very satisfying and perfect for weekdays! How is it gonna be diff if we put the meat at the same time with the rice from the beginning? Any thoughts? Don't ever put pork with the rice from the beginning. It'll become mushy and the meat is overcooked. Looks very tasty, is it very filling or more of a light snack? It can be a light meal. The portion is not large.